Once again written and produced with Louis Gordon, Crash and Burn picks up from where The Pleasures of Electricity left off. This time however, it's darker, heavier and more robotic than before, mixing contemporary electroclash with a heavy Kraftwerk influence. The album opens with the upbeat "Drive", a track not unlike “Automobile” from The Pleasures of Electricity. "Cinema" revisits some old familiar territory and "Broken Furniture" stands out as the album's most unusual song, with particularly haunting, Metamatic-esque lyrics. Other highlights include "Dust and Light", "Ultraviolet/Infrared", and the mechanical magnificence of "She Robot". As always for Foxx, this is a very 'visual' album, instantly summing up images from 1950s science-fiction b-movies, old horror films and black and white film noire. What Crash and Burn might lack in emotional quality, it makes up with in its raw energy and intense, quickfire synths. The emotion present on the duo's previous album is absent on this record, giving it a rather cold, heartless quality, which works on some tracks, but often leaves you yearning for something more, but don't let that put you off! Foxx and Gordon toured to promote the album in 2003, also releasing The Drive EP and supporting The Human League later in the year. 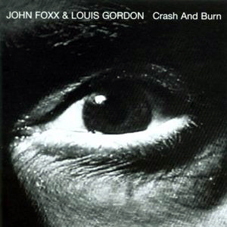 Crash and Burn was met with critical praise, and is perhaps Foxx and Gordon's darkest and heaviest album to date – again offering something different to its predecessors. Crash and Burn was remastered and re-issued in 2010, and came with a bonus disc which included the Drive EP tracks, live tracks and three previously unreleased songs, "Labyrinth Generator", "Storm Warning" and Broadway Submariine."